What kind of lawn do you want? How much time and money are you willing to spend on it? Remove as many weeds and as much debris as possible. Thoroughly rake or dethatch the lawn. Thatch: is comprised of living and dead material (i.e. grass clippings, grass stems, and other debris)—usually hidden by the grass the material accumulates and decomposes over time. Many cool weather grasses don’t create heavy thatch. Warm weather grasses, like bluegrass do create heavy thatch. Thatch can prevent fertilizer from reaching the soil. It can also play host to insects and fungal diseases. Usually, using a hand rake will do all you need for dethatching; however, some lawns may require the use of a dethatching machine. The machine makes vertical cuts into the lawn and pulls the dead material to the surface. Based on the pH results add the soil amendments. Create a regular maintenance plan. “An attractive, carpet-like lawn adds value and enjoyment to any home. But these benefits can come at tremendous cost to our environment. Lawn care practices can impact water quality. At risk are lakes, streams and eventually the ocean–the sendpoint of all watersheds. The pursuit of the "perfect" lawn now drives many homeowners to use an unprecedented volume of herbicides, insecticides, fungicides, fertilizers and herbicide-fertilizer cocktails known as weed and feed products. This offers little or no benefit to turf. 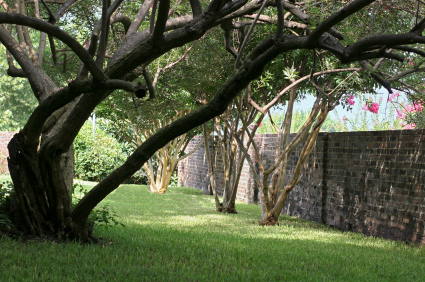 By applying horticultural knowledge instead of pesticides and fertilizers, YARDSCAPING practices can create quality turf that delivers recreational and eye-pleasing benefits. Before planting grass seed be sure to have a level area (without any low places) and have at least six inches of good topsoil. Spread lime over topsoil at the rate recommended as the result of a soil test. Spread a high quality starter fertilizer with a 1-2-1 ratio at the manufactures recommended rate. Next a good blend of lawn seed, 4 to 6 lbs. per 1,000 square feet, depending on mixture. Rake these in, raking both ways to get an even distribution. It is important to mulch the whole area with straw or hay. This prevents birds from eating seed, prevents washing in case of heavy rain, and moderates soil temperatures. Do not rake mulch off after grass starts to come through. Start to mow when grass in 3 inches tall and leave the clippings. This protects the tender grass roots. WATERING: Improper watering is the biggest cause of failure in a newly seeded lawn. How much water to apply depends on soil type. Keep the soil constantly moist to a depth of 4 inches. NEVER let the surface dry completely. After 4 mowings you can reduce the watering to 1-2 inches a week, depending on your soil type. Apply the water in 2 sessions (applying large amounts of water in fewer sessions promotes deeper rooting than applying less water more often). MOWING: NEVER cut more than 1/3 of top growth at a time. Cutting more growth can stop root growth for up to 28 days. When grass has reached 3 inches, mow to 2 ¾ inches. Continue mowing at 3 inches until Sept. 1. Then mow to 2 ½ inches until the last mowing of the season, which should be to 2 inches. In spring, mow 2 ½ inches until May 15, then back to 3-3 ½ inches. ALWAYS keep mower blade sharp. This is especially important the first 4 mowings, as the roots are shallow. FERTILIZING: If your lawn was properly installed, a fertilizer with a 1-1-1 or a 1-2-1 ratio was added to the soil at the time of installation. Re-apply fertilizer with the same ratio every 6 weeks (up to 4 times total per season). After the lawn is a year old, go to a turf builder with a 6-1-2 or 6-2-2 ratio 4 times per season. Natural organic is best, as it builds the soil while feeding the plants. Apply at a rate so you are achieving 1 lb. of nitrogen per 1,000 square feet. pH is a quantitative measurement of acidity/alkalinity of the soil. pH is typically rated on a scale of 0-14; 0 being acidic and 14 being alkaline. In the Northeast our soil is typically acidic. Adding lime raises the pH and is commonly referred to as “sweetening” the soil. Proper pH can ensure that the nutrients in the soil are available to plants and that they aren’t leaching out of the soil. Adding too much lime to raise the pH or too much sulfur to lower pH can be detrimental to your soil because it can kill off essential microorganisms. The goal pH for a healthy lawn is between 6 and 7.